I am using a new technique for this butterfly. I was inspired by a post by Darlene D. on her blog Darlenedesign.com about coloring on Vellum. I just loved the card that she made using heat embossing on Vellum paper and coloring with Copics on the back. Check out her tutorial video. I hope she does not mind my referring to her post. I stamped with versamark ink and heat embossed with black EP on Yellow Vellum paper and then colored with Copics on the back. I could have used plain vellum too but thought the color might be richer on a color. 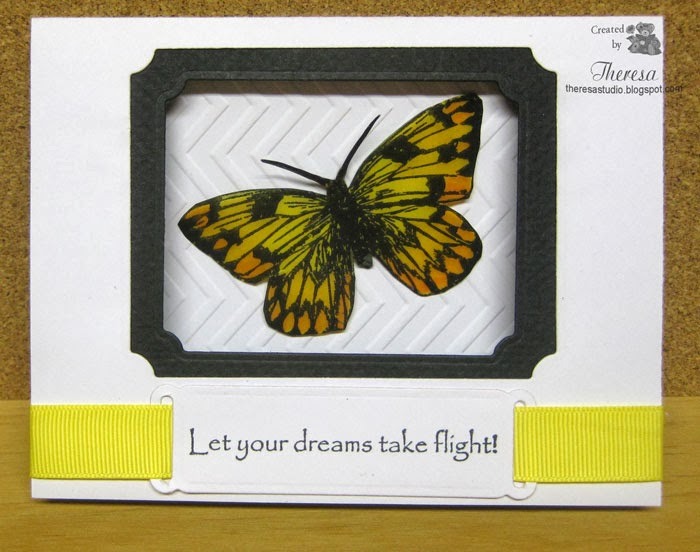 I fussy cut the butterfly and attached with foam tape to the inside of the card. On my card base of white cardstock, I cut a window with Spellbinder dies and made a frame for the opening with the dies and black textured cardstock. I stamped the sentiment and cut with a Spellbinders Tag die and attached to the card with ribbon. Before attaching the butterfly to the inside, I embossed the interior with an embossing folder. this is a gorgeous butterfly, well done. Glad you joined us at Sweet Stampin' this week. A beautiful card. Love the coloring of the butterfly and the embossed background on the inside. Great inspiration. Nice butterfly and yellow ribbon! Just what we like to see at Crafty Ribbons! Thanks for joining our challenge this week and welcome back tomorrow for a new one!